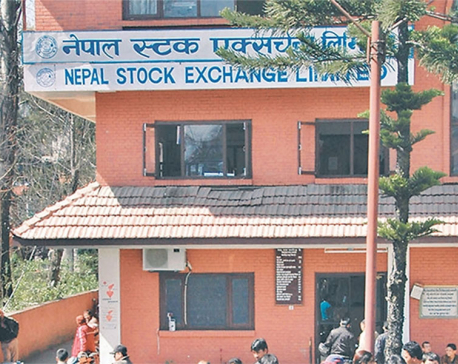 KATHMANDU, Aug 21: The equity market came under pressure from the very beginning of trading on Monday as the benchmark Nepal Stock Exchange (Nepse) index shed more than 9 points around midday. The index tried to maintain its level in the remaining session of the day and ultimately closed 8.22 points lower at 1,188.07 points. 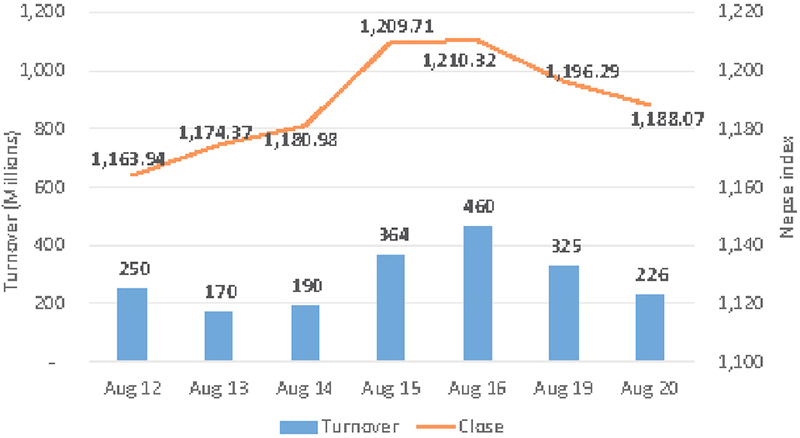 In terms of overall market activity, the bourse saw a decline in total turnover by 30.46 percent as compared to the preceding day. 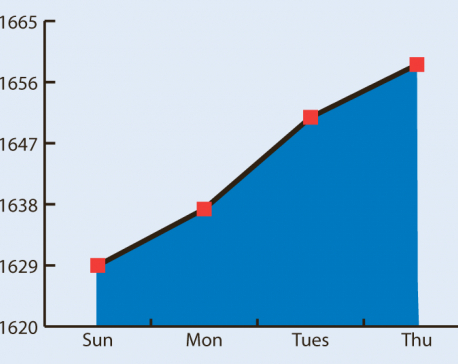 Over Rs 226 million worth of shares were traded on the day. In terms of sectoral performance, only Manufacturing & Processing sub-index managed to log gain of 0.51 percent. All other sub-indices closed in red. Major weakness was visible among Hydropower stocks as its sub-index declined by 1.69 percent. Sub-indices of Life Insurance and Non-life Insurance sectors also shed 1.31 percent and 1.02 percent, respectively. Development Bank, Microfinance, Others and Banking sub-indices also ended the day in red. Nepal Investment Bank Ltd Promoter Share led the list of active stocks on Monday as more than Rs 18 million worth of its shares changed hands. Next on the list was Nepal Investment Bank Ltd which posted total transactions of Rs 9 million. Likewise, Nabil Bank Ltd and Chilime Hydropower Company Ltd logged turnovers of over Rs 8 million each. Nepal Life Insurance Company Ltd, Bottlers Nepal (Terai) Ltd and Global IME Bank Ltd were the other active stocks of the day. World Merchant Banking & Finance Ltd was the biggest gainer of the day as its share price went up by 5.26 percent. Furthermore, share price of Janaki Finance Ltd climbed over 3 percent, while share price of Mahuli Samudayik Laghubitta Bittiya Sanstha Ltd, NMB Sulav Investment Fund-1 and Unilever Nepal Ltd went up by over 2 percent each. On the contrary, Sindhu Bikas Bank Ltd witnessed worst performance of the day as its share price plunged almost 10 percent. Likewise, shares of Rastriya Beema Company Ltd Promoter Share and Himalayan Power Partner Ltd also slid over 7 percent each. Other losing stocks include Khanikhola Hydropower Company Ltd, Chhyangdi Hydropower Ltd and Support Microfinance Bittiya Sanstha Ltd. Among the companies publishing their earnings reports, Neco Insurance Company Ltd reported a growth of 39.55 percent in its net profit. Similarly, the financial report for the fourth quarter of Fiscal Year 2017/18 of Nepal Seva Laghubitta Bittiya Sanstha shows a decline of 12.51 percent year-on-year in its net profit to Rs 4 million. As per the ARKS technical analysis model, the Nepse index formed a bearish candlestick on a daily timeframe with a dismal volume. Hence, a strong direction in the equity market is yet to be observed.